Good morning, Mr. Hartzman. 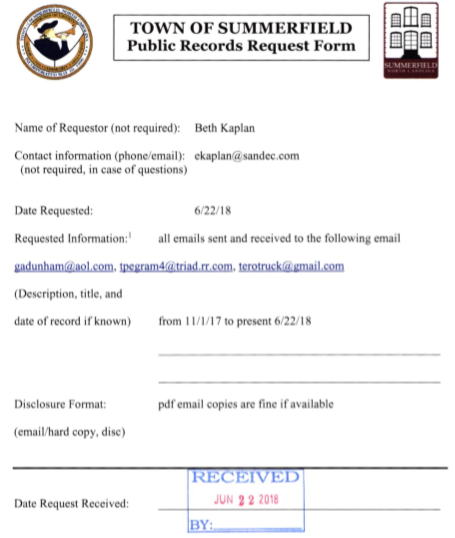 I’ll address some of your items, but the main starting point is for you to complete a public records request (form attached) as our attorney also directed so that we can formally track and process your requests. We can ask Mayor Dunham for her text messages, but she doesn’t have a town-issued phone and that would have to be provided voluntarily (as would many of her emails as they reside with her personally). The town desires to fill all requests in a reasonable amount of time, but can’t provide a turnaround estimate because several elements are dependent upon the mayor submitting requested info. The town cannot address whether or not public records in the mayor’s possession have been destroyed, but internally, records are kept per our retention schedule. 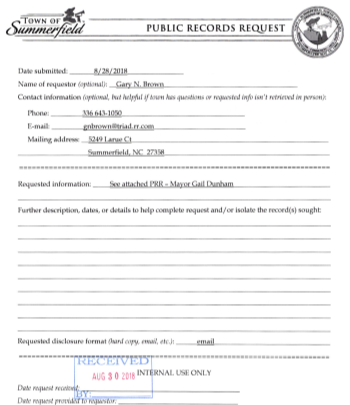 PUBLIC RECORDS NOTICE: Communications from this e-mail address may be subject to public disclosure under NC Public Records Law, but may also contain confidential information. If this e-mail has been sent to the wrong person, please notify the sender immediately by reply e-mail and delete the message. Once again, Gail has decided to follow her own set of rules. She is not complying in the same way that she required as a citizen and is in no way being truthful. This is ridiculous and malicious. She filed over 100 public records requests in a span of five years. Unfortunately, the email response from Gail also seems to erroneous and delusional. There are way too many mistruths and I appreciate Scott’s clarification. I truly hope that there is a lengthy story by the local media highlighting her lies and a subpoena in the very near future to expose more of the her inner circle malicious activities. The mayor is obstructing justice. Please stop digging madam mayor. As a broader response regarding your potential suit against the town, staff has no desire or reason to withhold the emails you are seeking. There is frustration internally and externally with our situation. I received response from Town Hall at 5:15 PM on Friday (9/28) that the town will not be providing any records pursuant pair of requests I made in early Sept - one PRR for CDR (call detail record) for all town hall telephonic services, including VOIP, cellular, & traditional land line and another PRR for all town hall messaging detail records, to include all cellular devices. Response stated town hall is not in possession of those records and that it is believed the town is under no obligation to retrieve those records from telephonic service providers nor is town obligated to request town service providers to produce those records. Mr. Hartzman, I expect these will be reported to you as "not outstanding" PRRs - an assessment I disagree with. It is believed that town hall "land line" service provider is Time Warner (a.k.a. Spectrum). If true, Time Warner will provide last 90 days of CDRs - both incoming and outgoing - on request of the account owner. I understand there is $2 fee charged per month for this service - a fee I'll cover if only town hall will make the request to be provided CDR for last 90 days for all DID (direct inward dial) numbers they service for town of summerfield. It is believed town hall pays for at least one Verizon Wireless cellular device. Perhaps it is different for commercial service, but for consumer VZW accounts the account owner can retrieve at least 12 months of CDR records and 90 days of text message detail records via the VZW online account management portal. Commercial accounts should have same or greater access to CDR and text message detail history. It is also believed same records can be obtained by same process as Time Warner CDRs - i.e. the account owner (town hall) can call VZW account manager and request last 12 months of CDR records and last 90 days of text message detail records. I also have PRR for last 30 days of all town hall surveillance video submitted 20 Mar 2018. You will hear the Manager state that the service they subscribed too only retained last 7 days of footage online (which doesn't comply with NC Records Retention Requirements). It is my understanding other requests for video footage within that time period were fulfilled - again, for emphasis, it is my understanding. So far I've not received any (i.e. zero) video data for the period requested when others have been purportedly fulfilled. 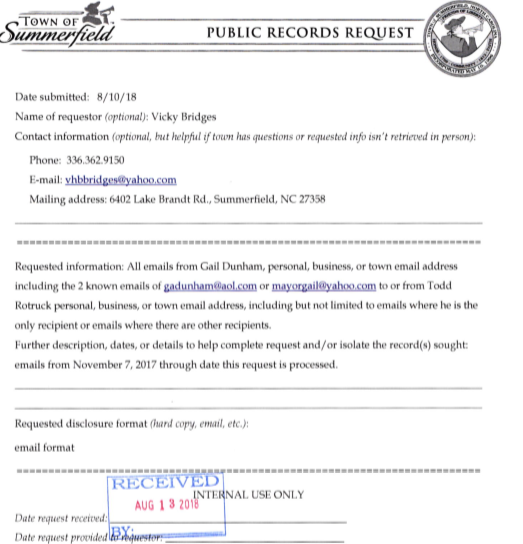 I am one of the 10 people who have submitted a public records request to the Town of Summerfield (mine dates back to June 21) for all emails to/from Mayor Gail Dunham to and from Todd Rotruck (former town councilman) and to and from Teresa Pegram (current town councilwoman) sent to and from the mayor using her two known e-mail addresses, mayorgail@yahoo.com and gadunham@aol.com. The town cannot fulfill these requests because the mayor did not provide the town with the emails. We do now know through the release of one of these emails (which I quote here) that the mayor knew that Todd Rotruck did not live in Summerfield and set out to defraud the town and its citizens by suggesting he move an RV to his Summerfield property and “bring horses” to make it appear he lived in Summerfield rather than his Lewiston Road home in Greensboro. “I think it was terrible that they transferred your voting residence to Lewistown Rd. (sic) and literally stripped you of your constitutional voting rights. You do not own Lewistown Rd. (sic) and that property will be bulldozed very soon…. “Why not move an RV to Strawberry Rd ASAP — like tomorrow. Get it hooked up and stay there for a bit. “Maybe get the horses there. That would get family there too. “Is there any same day early registration and voting? “You don’t care if you vote on May 8th — you just want to be a registered voter in Summerfield. I suspect there are many other damning emails as well. I hope the News & Record will stay on top of this story and investigate further the mayor’s unethical behavior and failure to release her public emails. As citizens we deserve no less." "Who is running Summerfield's circus? Who is running the town of Summerfield? Is it the elected mayor and Town Council, or is it the lawyer and manager who work for them? Because it sounds as if there’s a real question of who is the ringmaster of a rapidly developing circus. Translation: Because these emails aren’t generated at town expense, she won’t release them, which violates state laws about open records. An elected official can’t avoid the spotlight by using private communications channels. You probably have heard that somewhere..."
SUMMERFIELD - It's going on five months since the first of over a dozen public records requests was submitted to the Town of Summerfield and as of Sept. 5, none have been fulfilled. After town business-related emails surfaced weeks ago which were sent to and received by Mayor Gail Dunham at her gadunham@aol.com account, which she has claimed is only for personal use, citizens have continued to request specific, or all of Dunham's town business-related emails, regardless of whether they were sent to or received at mayorgail@yahoo.com, gadunham@aol.com or any other account. Still, the mayor refuses to release her emails, claiming all of her emails pertaining to town business are stored on the town server. Town Manager Scott Whitaker has repeatedly said that is not the case. "Regarding our mayor's mayorgail@yahoo.com address, there is no connection between this account and the town server. The town possesses emails from this address only when they're received by addresses that have a connection to our server, such as swhitaker@summerfieldgov.com, clerk@summerfieldgov.com, etc.," Whitaker recently wrote to a citizen. "Otherwise, the town doesn't have access to this address when the mayor emails citizens, contractors, agencies, legislators, etc., or when others email her at this address. "Nothing has changed regarding what records the town possesses. Certainly it's in possession of many emails from our mayor, but the requestors are asking for either all of the mayor's town-related emails or specific ones to individuals that the town has never possessed," the town manager added. The most recent email that surfaced was sent out April 18, 2:02 a.m. from Dunham's gadunham@aol.com account to seven recipients, including Council member Teresa Pegram (emailed to her personal email address), Todd Rotruck, former town finance officer Dana Luther, former town council member Elizabeth McClellan and four other citizens. In it, Dunham, was lamenting the Board of Elections' unanimous decision the previous day that Rotruck had not established permanent residency in Summerfield and his voter registration should be changed to reflect his Greensboro address - which disqualified him from holding office in Summerfield. "Why not move an RV to Strawberry Rd ASAP - like tomorrow. Get it hooked up and stay there for a bit," Dunham wrote. "Maybe get the horses there. That would get family there too. "Is there any same-day early registration and voting? "You don't care if you vote on May 8th (referring to the Primary election) - you just want to be a registered voter in Summerfield. "Can you go to a Motor Vehicle voter registration - or any other location and register to vote at your Strawberry Rd address, knowing you cannot vote May 8th? You will be physically there if that makes a difference." Citizens submitting public records requests for the mayor's town business-related emails say they have contacted the attorney general's office, the Sunshine Center of the North Carolina Open Government Coalition, and the ACLU and they may have no choice but to take legal action if the mayor and Council member Pegram, who also has unfilled public records requests for her town business-related emails, do not provide their emails as requested. Public records: property of the people? It's now been 3 1/2 months since Summerfield Mayor Gail Dunham received her first public records request for copies of email communications relating to town business since she was sworn into office on Dec. 12; at least 10 similar requests have been processed by the town clerk since then, with none yet fulfilled. In this issue we share more of the comments we received recently after we reached out to citizens in northwest Guilford County, including past and present town council members, and asked 1) Do you feel elected officials' communications regarding the business of the communities they represent should be considered public records? ; and 2) If so, should there be any consequences when those communications are not provided upon request? Oak Ridge Mayor Spencer Sullivan responded, "It is a fact that both the public records laws and public meeting laws define elected officials' responsibilities to the public in the execution of their work. Any elected official must accept those responsibilities upon taking office, and act in accordance with both the intent and spirit of those laws. It is critical to maintaining the trust and confidence of our citizens, and as mayor I am vigilant in assuring our council does so. "Our town council and staff make every effort to respond very promptly and complete any PRR we receive, and ensure we are in full compliance," Sullivan continued, explaining the town has a standard form that those submitting a PRR are asked to complete. "But it is a very simple form that asks which records are being sought, what media form is desired, and for a contact name and phone number - the reason we ask for a name and phone number is twofold: in case we need to clarify what records are being requested; and to notify the requester the records are ready to be picked up. "Everything we do on behalf of the town is subject to public records requests (with specific exemptions, as outlined by N.C.G.S. 132)," Sullivan continued. "...As part of the required training for elected officials that we go through with UNC School of Government, we were instructed on how to handle our communications and that has been reinforced by our attorney." "100 percent yes to both questions!" Summerfield resident John Van Kemp responded. Oak Ridge resident Mike Stone, a former town council member, responded: "All, all, ALL emails and other communications' records are public records and should be available to anyone who requests them. I'll add that all means all emails, voicemail, texts, and even social media posts that pertain to town business... If someone is concerned about keeping their discussions and communications private, they do not need to be elected officials or serving in a volunteer capacity for the town - or - if they don't want their communications public, they need to learn the art of verbal communications. "I believe that all records should be turned over to the town attorney within 72 hours of the request," Stone continued. "That's a fast turn-around, I know, but I maintained every email and text so that as soon as it was requested I could pull the information and forward it. It's irresponsible as an elected official to not have the public's records in order. "My personal opinion is that no public records request should take more than 10 business days (three days to assemble and send to the attorney and seven days for him/her to review and forward to the town manager so it can be presented to the requestor). If a request for public records goes unfulfilled for more than 15 business days, I could easily support a law or ordinance that removes/suspends the elected official, employee or volunteer from any town activities until such time as they comply with the law/ordinance." Stone added that the town/city should also do its part to respond to citizens seeking information via a public records request. "I've made requests for information only to be told where I can go to get the information myself," he said. "I'm sorry, but my tax dollars pay for employees to fill my request, not provide instructions on how to search the town's website for the information." Responding via the Northwest Observer's Facebook page, Judi Bastion said, "...Town employees and elected officials need to use established means of communication. Since there have been numerous record requests in the past and (Summerfield) candidates ran on this issue, transparency that was promised needs to be delivered." Oak Ridge Town Council member George McClellan had this to say: "All communications pertaining to the town's business are a matter of public record regardless of whether it is between me and the staff, me and another council member, or between me and a constituent." With regard to any recourse for not fulfilling a public records request, McClellan said it should be "Whatever the law allows. Whenever our clerk informs me of a public records request I do my best to have everything requested to her within 48 hours." Stokesdale Town Council member Frank Bruno responded, "If a member of council is discussing town business with a member of the public then this should be information that is made public if and when requested. "As far as making these available, there should be a reasonable time to reply as long as the request is not vague. Specific requests for a specific item should be responded to within a week of when the request is made and the proper paperwork is filled out. There may be times where the request needs to be reviewed by the town attorney to make sure the requested information can be released to the public, but this should not take an unreasonable time to accomplish," Bruno continued. "What I mean by a vague request is if someone requests all of the emails that have been written by a specific council member without specifying what the subject of the emails are. While this could be provided, it would take an inordinate amount of time to accomplish and we do not have the manpower or budget to have an employee spend their time on this type of request. "As far as a penalty for not supplying records, deleting, or being selective in what is provided, there should be a penalty imposed on the individual or town that does this. As far as what that should be, I'm not sure how you could impose the penalty. I know the person requesting the records can file a court action to get them, but there doesn't seem to be any penalty to recover attorney fees. You could censure that member of council, but they would still be able to conduct their council business. Repeated offenses could be dealt with more harshly, maybe with a monetary penalty - but who would impose the penalty and who would collect it? "The best penalty is imposed at the voting booth, by citizens not re-electing those individuals." "Absolutely, emails relating to public business should be considered public record," said Oak Ridge Town Council member Doug Nodine. "The only exception might be when the official is negotiating on a personnel matter or the purchase of real property. "With respect to recourse I am not sure what you have in mind, but public flogging might be on the extreme side," Nodine added. "Of course, the ultimate recourse should take place at the voting booth." And Oak Ridge Town Council member Ann Schneider had this to say: "Transparency in government is essential to maintaining trust and keeping communication open with the residents we serve. I fully support both our open meeting laws and our public records laws that make all aspects of our work accessible to the public. "Having served on the Historic Preservation Commission for several years, I brought experience complying with both of these laws to my current role on the Oak Ridge Town Council," Schneider continued. "While on the HPC, I had no difficulty complying with even a broad-ranging public records request (PRR), since the majority of my emails included town staff. The others were easily located using simple search tools within my email program. I have also submitted a PRR myself at the state level. I was grateful that my request was treated seriously and responded to promptly - it really increased my confidence in our state government. "Public servants at all levels need to take their responsibilities seriously. There are already some consequences in place for those who don't. For example, PRRs that aren't fulfilled in a timely manner can lead to media attention and an erosion of confidence - as we are already seeing. I understand that North Carolina statutes also allow residents to sue in civil court when PRRs aren't fulfilled in a reasonable time period, but I would hope that this won't ever be necessary in our northwest community." Over three months have passed since Summerfield Mayor Gail Dunham received her first public records request for email communications relating to town business; to date, none have been fulfilled. 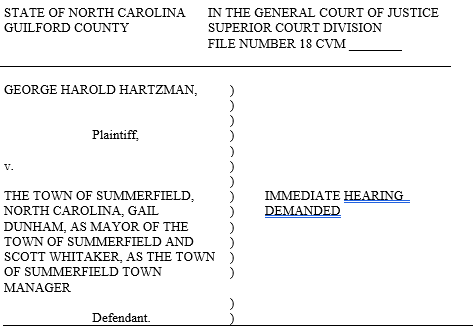 SUMMERFIELD - According to North Carolina General Statute 132-1, public records (documents, emails, recordings, etc.) and public information compiled by the agencies of North Carolina government (i.e., elected officials or public officers) "pursuant to law or ordinance in connection with the transaction of public business" are property of the people. 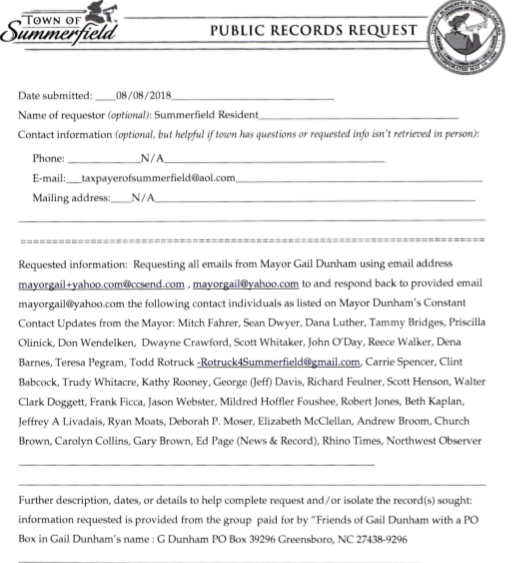 As we have written previously, on June 19 the Northwest Observer submitted a public records request for Summerfield Mayor Gail Dunham's town business-related emails dating back to when Dunham took office on Dec. 12. Although Summerfield Town Attorney Bill Hill has confirmed the Northwest Observer's public records request was both valid and complete, neither that request nor any of the other requests the Town of Summerfield has processed for Dunham's emails in the last three months have been fulfilled as of the writing of this article. Hill sent an email on Aug. 1 to those who have submitted requests for Dunham's emails, in which he stated, "By now, you should have received a response to your public records requests from Gail Dunham. Regrettably, these responses may well lead you to believe or presume facts which are not accurate. For that reason, as the town attorney, I feel compelled to correct these inaccuracies and will attempt to do so. "Please note that I am not copied on any of the emails (from Dunham to those making public records requests)," Hill continued. "They were sent without my review, input or approval. The responses contend there are deficiencies in your requests. However, those contentions are inconsistent with the law. In other words, your requests are valid in my opinion, and the claimed deficiencies are not a basis for refusal to answer. "In addition, the town has no access to Gail Dunham's emails from the mayorgail@yahoo.com address or any other personal address..."
"Without a doubt, any and all emails/texts/tweets/etc. involving town-related business between an elected official and any recipient need to be part of the public record," Oak Ridge Town Council member Jim Kinneman said. "As an elected official I fully understand, accept and support that anything I say in an email is part of the public record. Without this level of transparency we all lose. "With electronic records the time period that is considered 'reasonable' should be fairly short, i.e., a week or two. Keeping track of these emails is easy - I try to always cc someone on town staff. This accomplishes two things: 1). It makes it part of the town email record and 2). It keeps town staff informed about my discussions with citizens and others. To that point, this email (between Kinneman and the Northwest Observer) was cc'd to town staff. "If an elected official doesn't comply... removal from office would be a bit extreme, but there does need to be a negative sanction for not providing the records in a timely and complete form." Former Summerfield Town Council member Gary Brown agreed that town business-related communications should be accessible to the public, and should an elected official not make public records accessible, there should be consequences. "As 'public servants,' all elected officials should be expected to fully comply with both the letter and spirit of the law," Brown said. "Yes, communications should be public record whether they are written on paper or sent through email or texts," Rex Riley wrote on Northwest Observer's Facebook page. "If they are discussing official business on behalf of or will affect the public they represent, the communications should be public. I must add if a person is doing right they will not have a problem with communication being public. There should be a set time that the records are available..."
Dena Barnes, Summerfield mayor pro tem, said public records in written or recorded form should be provided upon request. "If a council member has to use their personal email, they are still responsible for fulfilling public records requests and I have done this in the past." As to consequences for not fulfilling records requests, Barnes said, "There should be recourse to make an elected official comply with providing public records requests if they do not provide them. When they take office they have a responsibility to the public." Speaking specifically to Dunham not fulfilling her records requests, Summerfield resident Whitney Lee wrote on Northwest Observer's Facebook page, "Her (Gail Dunham's) negligence in performing her mayoral duties portrays distrust in the eyes of the citizens and recourse should be taken." 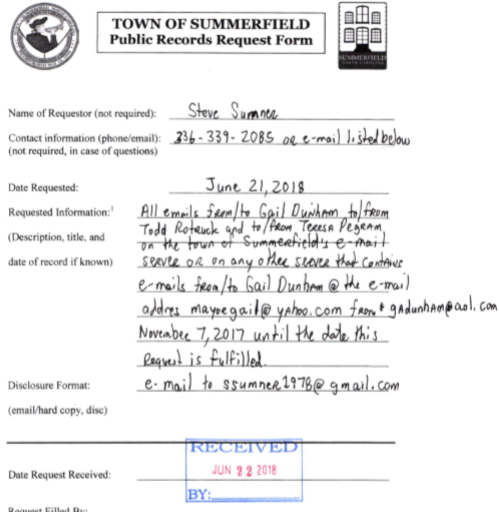 SUMMERFIELD - Another week has rolled by and Mayor Gail Dunham, who ironically ran for office on a platform of transparency, has still not fulfilled even the first of what is a mounting pile of public records requests (10 to date) for copies of either all or specific town business-related emails she has sent and received since being sworn into office Dec. 12; the oldest request on file is dated April 25. Town Manager Scott Whitaker sent an email July 24 to those who have submitted requests for Dunham's emails, apologizing that they had not yet been fulfilled. He explained the town is not in possession of the emails and the mayor has declined the offer of technical assistance to retrieve them. 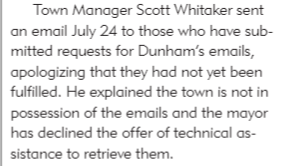 In a follow-up to Whitaker's email, Town Attorney Bill Hill confirmed he had reviewed the public records requests for Dunham's emails as they were received and sufficient information was provided from all the requesters. The mayor has listed five requesters who she said did not sufficiently complete their public records request form and said she would not respond to "piecemeal" requests or make additions or corrections to them. The Northwest Observer was included on the mayor's list for a request submitted on June 19, and she has not responded to repeated questions about what information was missing from the request. 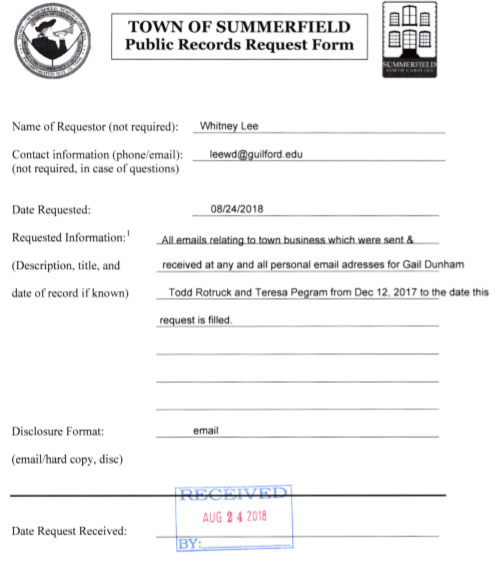 "My public records request complies with Chapter 132 of the North Carolina General Statutes and I cannot legally be required to provide any information that has not already been provided on my PRR form dated June 19," Northwest Observer Editor Patti Stokes wrote in an email to Dunham on July 24. "I feel confident there is nothing legally missing from my request and you are therefore obligated to fulfill it... exactly what information do you find my public records request dated June 19 is legally lacking and is keeping you from fulfilling it? Please answer the question." 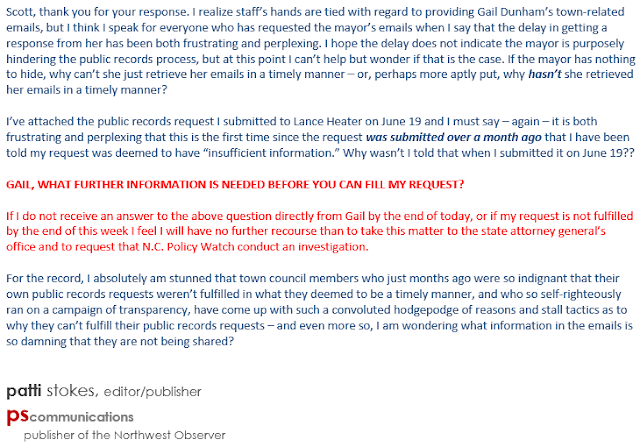 Dunham wrote back that she did not have a copy of the Northwest Observer's public records request, and offered this advice to Stokes: "I suggest you keep your request with the Town as they have all the Summerfield town business emails and request them all, so that no word, phrase, or sentence is taken out of context. Town also has the IT expert to get them off the town server." 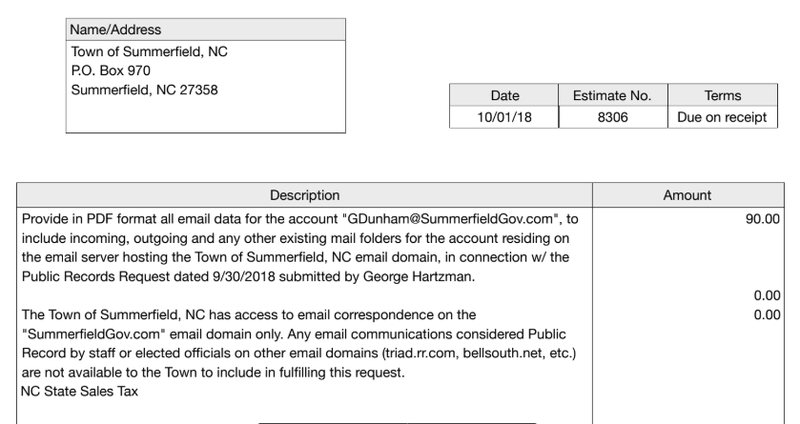 But the town can not get Dunham's town business-related emails off its server because Dunham declined a summerfieldgov.com email account when she took office in December, opting instead to set up her own email account through yahoo.com. Dunham has also used her personal gadunham@aol.com account to communicate with select individuals about town business. "Your statement that the town has 'all the Summerfield town business emails...' and that our IT contractor can 'get them off the town server' isn't truthful," Whitaker wrote to Dunham on the morning of July 25 after learning she had pointed the Northwest Observer back to the town to access her emails. "We have zero access to emails that you send and receive from either of your two known email addresses aside from those ultimately received by our server. Stating that me, Bill Hill, or staff can provide all (or even a majority of) your emails is passing the buck... You have multiple, valid PRRs awaiting your compliance." Dunham holds the record for submitting the most public records requests of any citizen in the town's history, and has frequently and publicly chastised town staff and council members for not fulfilling them in what she has deemed a "timely manner." 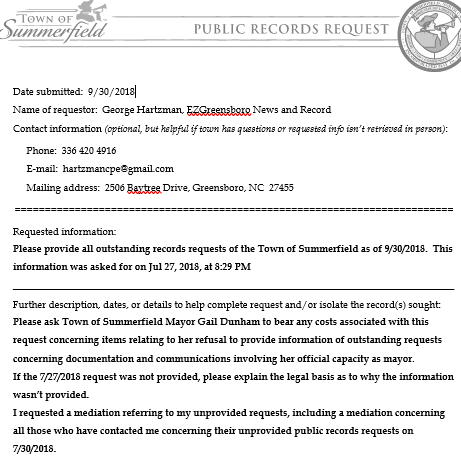 SUMMERFIELD - Until recently, every public records request submitted to the Town of Summerfield was automatically forwarded to the town attorney for review before steps were taken to fulfill the request. According to the town's revised public records policy which was approved at the July 10 town council meeting, attorney review is no longer required, unless the person who possesses the requested public record(s) has a concern about whether the request complies with NCGS Chapter 132. If there are concerns, the town manager will consult with the attorney, or forward the record to the attorney for review or clarification. During the more than 30 minutes the policy change was being discussed, Mayor Gail Dunham urged the council to table the issue, saying the town should undergo more due diligence, consult with the League of Municipalities, and that the town attorney should be present (the attorney reportedly was absent from the meeting due to having food poisoning). Town Manager Scott Whitaker assured Dunham the town attorney had reviewed the revised policy prior to the meeting and made only one suggestion, which had been included. Most of the discussion centered on fees for photocopies or CDs and, in some cases, a "special service charge" for fulfilling public records requests. According to the revised policy, "if the manager deems a request involves a special service charge, a cost estimate will be provided to the requester and payment will be collected prior to further processing the request." Whitaker explained the purpose of the special service charge isn't to make money off the requests, but that some requests require the town's IT person, attorney or other contracted professional to get involved, which drives up the cost. "We just want to cover the cost that the statutes allow us to recover when there is something special we have to do," Whitaker noted. The town's previous public records request policy stated that all requests should be in writing and should include the requester's name, full address and telephone number. According to state statute, the town cannot require a requester of public records provide their name, phone number, address, or the reason for their request. The revised policy adopted July 10 does not request the name or contact information for the person making the public records request. 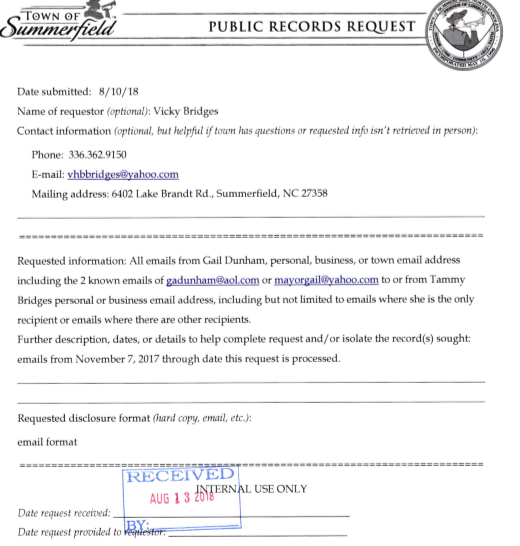 SUMMERFIELD - Since April 26, the Town of Summerfield has received 10 public records requests for copies of either specific, or all of Mayor Gail Dunham's emails relating to town business since she was sworn into office last December. As for those requests being fulfilled, "As far as I know, nothing has happened," Town Clerk Lance Heater told the Northwest Observer on July 11. According to the town's Public Records Request (PRR) policy, all requests must be in writing, be dated and specify the information being requested and the format the requestor would like the information when the request is fulfilled (i.e., electronic or hard copy). When he receives a PRR, Heater said he acknowledges receipt of it and opens a file for the request the same day. Effective with the July 10 town council meeting, when the council voted to revise the town's PRR policy, Heater forwards the request directly to the "custodian" of the record (i.e., the town council or staff member who must provide the information requested). If the custodian has concerns as to whether the request complies with North Carolina General Statute 132-6.2(a), which pertains to public records, that person will advise the town manager, who will consult the town attorney or forward the request to the attorney for review and clarification. The town states that potential responses to a public records request include producing the entire record as requested, denying the request with an explanation, or providing or denying the request in part with an explanation of why it is only partially fulfilled. 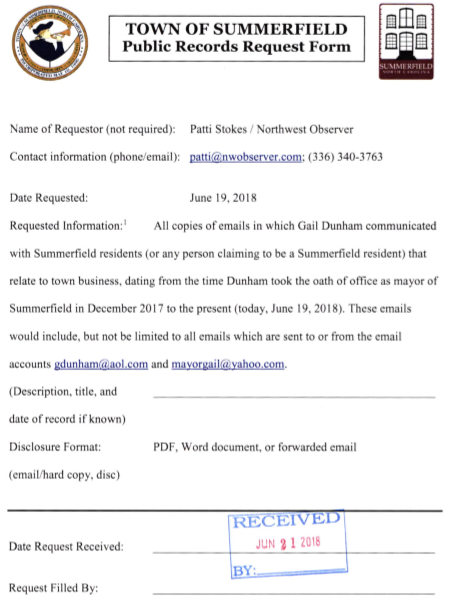 On June 19 the Northwest Observer submitted a PRR for copies of Dunham's emails to Summerfield residents that relate to town business and were sent from either of her two known email accounts, or any other email account she uses. On June 26, Dunham handed a copy of a personal memo citing the town's Public Records Request policy to a Northwest Observer reporter after the special call meeting that evening. In the memo, Dunham wrote that all written requests should include the name of the requestor, the full address of the requestor and a telephone number. The Northwest Observer did provide a telephone number but not a mailing address when it submitted its request, and a mailing address was not requested on the town's Public Records form obtained from its website. "Friday, June 15, 2018 I received three public records requests, and two had only a phone number for contact, and the phone number was not registered in that same name," Dunham wrote in her personal memo. "This is just one example of inconsistencies. The two with only telephone number should be completed and filed accurately from that person." Although the contact information Dunham cited may be requested, according to state statute, a person making a public records request is not required to provide his or her name, address, phone number or any identification. The statute also states that public records must be fulfilled "as promptly as possible," although it does not specify how long a public agency has to respond to a public records request. According to the UNC School of Government's website, "What constitutes a reasonable or prompt response will depend on the nature of the request and the available personnel and other resources available to the agency that receives the request. A prompt response to a fairly simple records request ranges from immediate, within a few hours, or within a day or two. As the request becomes more substantial, however, and the burden on the custodian becomes correspondingly greater, it seems reasonable to allow the custodian somewhat more time to locate and deliver the desired records... Unless a request is extraordinary, however, a custodian probably should respond within a week or two at most." 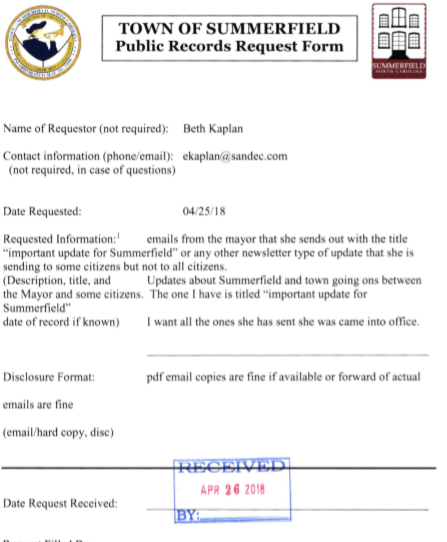 Prior to being elected as mayor, Dunham submitted countless public records requests to the Town of Summerfield and frequently criticized town staff and council members for not fulfilling her requests more quickly. 1.) 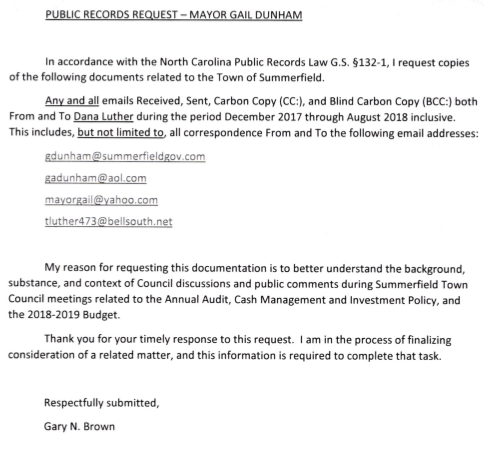 Mayor Dunham, you have refused to respond to requests for public records, on multiple occasions, which is a failure to uphold the duties of the office as defined by NC General Statutes and other applicable laws. 2.) On April 26, you had a meeting with Marsh Prause, Todd Rotruck's attorney, in the back of the parking lot behind Town Hall. This meeting occurred just prior to service of the lawsuit on the town by Mr. Prause, at approximately 10:45 a.m. Mayor Dunham failed to report this meeting or the discussion that occurred to the council or town attorney. There were multiple witnesses, and from those reports the meeting lasted at least 10 minutes. ...5.) On April 10, you did participate in the evaluation of an employee in public - specifically, the town manager. 6.) You failed to respond to multiple requests to produce a recording of the April 23 closed session meeting that members of the media and others have been told exists. You have not denied the existence of such a recording. ...8.) You have operated a separate email account dispensing 'town news' as mayor without notice to, or approval of council. In addition, you did not copy council, after requested, on those communications, which are public records. ...As for not providing emails and meeting recordings as requested by two citizens who submitted public records requests for them, Dunham said she was out of the country mid-May and didn't have access to email. "I am really buried in emails," she stated, adding, "I haven't seen the emails (regarding the public records requests)... I don't even know what is being requested." One of the requests is for "emails from the mayor with 'important updates from the mayor' and any other newsletter-type emails sent out to some citizens but not all citizens and any other updates about Summerfield and town goings on between the mayor and some citizens." 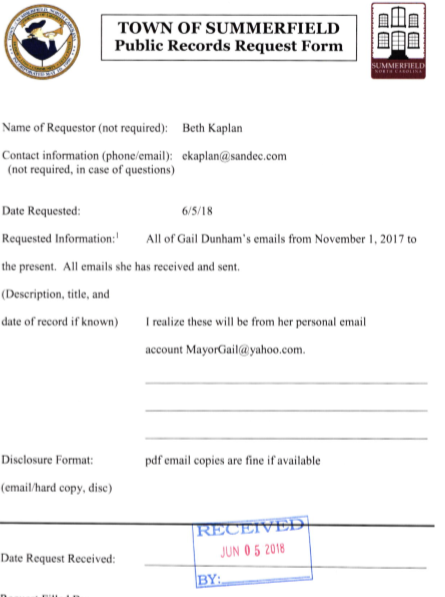 Another public records request from the same citizen is for all emails Gail Dunham has received and sent from the mayorgail@yahoo.com account since Nov. 1, 2017. A third public records request is for all video and audio recordings of meetings conducted at Town Hall between Dunham, Pegram and Rotruck. Town Attorney Bill Hill said he had emailed the mayor about the public records requests several times.